In order to excel growth in your toddler it is important to make him or her let free and let him walk them around. By letting they free and making them explore them things not only boosts their confidence but also make them independent. However there are certain things which should be kept in mind as little feet needs to be watched as they may get engaged in dangerous activities. Home is the best possible place to learn and explore things though they may be things which may prove to be fatal if proper care is not taken place. Once a toddler starts to walk his walk is not too stable and he may often stumble and fall therefore make sure that the floor is covered with carpet so that if the toddler falls ,he does not get hurt. Ensure that small things are not littered on the floor coz toddlers often have a habit of picking up things and putting up in their mouth. Many parents do not pay attention when they buy toys. While buying toys one must always check the age limit and also read the labels and prescription of the toys. Many toys are batter operated and may consist of small parts which can lead to choking if the child is not attended. 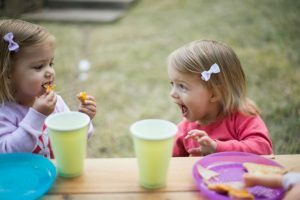 Try and teach your child to sit and eat using a fork and a spoon, remember to cut the food into small pieces so they do not choke them while eating. Make them learn to chew and eat food and eat slowly. Avoid feeding them with nuts and candies until they have teeth and can chew properly. Keep your child away from any open French windows and away from stair and lifts. Never leave the child unattended in places where there are electronic equipment’s .make it a habit to tape the open switch boards, it can be very hazardous if the toddler fiddles with the switch board. Now day due to automatic locks and turn around handles, there have been occasions when toddlers have locked themselves inside the bathrooms and toilets. It’s a wise idea to disable the locks of toilets and bathrooms and just in case if its not possible them educate your toddler how to open the lock if it is locked. Due to lack of ventilation the kitchen area can sometimes become to smoky while cooking, so in such a case resort to a chimney or keep the windows and doors open while cooking so that the toddler does not get suffocated. Keep matchsticks and lighter away from your toddlers reach. If you are living in a house where there are stairs then always remember to use child safety gates which screw to the wall. Also if the railing in the balcony has gaps then try to bridge the gaps with the help of wires or safety net. If you are using walkers, strollers and prams they always use a safety strap so that the toddler does not trip and fall. Because of too much or electronic media such as TV and computers, use a UV protection screen which would help in protecting the eyes of your child while watching them. Keep items such as mosquito repellents, detergent, and any other cleaning liquid strictly away from children and in a separate shelve which is not within the reach of your children. Try and keep the floor dry and if there happens to be a spill them immediately wipe it up, take special attention while giving a bath to your toddler. These were some of the basic things which must be kept in mind while your toddler is at home.